Reviews for theater within the greater Los Angeles area. Valerie Spencer, Danielle K. Jones and Drew Stafford Harper in the original production of Critical Mass Performance Group’s “Ameryka,” part of Center Theatre Group’s second annual Block Party at the Kirk Douglas Theatre. Note: The run of this play at the Douglas is very short. On the day of posting there are only two performances left. One of the more fascinating events at the Kirk Douglas Theatre in Culver City is the annual Block Party – a series of productions bringing in the work of other Los Angeles theater companies to share the stage of this Center Theatre Group space. The current temporary occupant is Critical Mass Performance Group, and their splendidly challenging “Ameryka”, written and directed by Nancy Keystone in collaboration with her performers. In the baldest terms, “Ameryka” is a composite look at the definitions of freedom and democracy as seen in the U.S. and the Poland of the freedom movement of the 1980s. The underlying structure looks at the weights upon those definitions which hold them, or have held them back from full realization of those lofty goals, and the societal and governmental ways that the terms have been twisted. Is this serious stuff, yes. Will some of the issues put forth be controversial? Yes. Is it a fascinating piece of challenging theater? Also yes. The structure of the piece intertwines time periods, national settings and cultural frameworks to weave a complex tapestry of images and juxtapositions which define the production’s main points. The members of the ensemble play many parts, large and small, though they are most identified by just a few. All deal in one form or another with the dichotomy between having great words and ideas, but sacrificing them to social or political pragmatism, versus living out an idealism which may prove sacrificially noble but difficult to maintain. Central and recurring characters provide the touchstones for the larger landscape. Curt Bonnem’s Thomas Jefferson balances the words of his writings against his continued acceptance and utilization of slavery. Jeff Lorch balances this with the idealism of Polish hero Tadeusz Kosciuszko, who fought in the American Revolution and tried to bring its stated ideals (as opposed to actual results) back to his native land. Russell Edge’s CIA Director William Casey confidently maneuvers behind the scenes to aid Valerie Spencer’s Anna Walentynowicz, one of the driving forces of Solidarity, the union which triggered the gradual downfall of Poland’s Communist government. Ray Ford’s African-American jazz musician, Gene Jefferson, encounters the lack of perceived racism as he visits Poland, putting him at odds with fellow African-American, government insider CIA Agent Curtis Brown, played by Lorne Green. Richard Gallegos’ Chief Little Turtle hovers over the supposed freedom of the U.S. as a reminder of a people sacrificed in the process, Liza Seneca’s Ewa becomes the voice of the Polish underground, while Nick Santoro supplies the questionable CIA Agent Weller. Still, simply defining main characters misses the essential point of this piece. What it confronts is best expressed in the constant use of bricks – simple bricks – to represent the weight carried with them on their journeys. The baggage of expectation, failure, compromise, even hypocracy, “Ameryka” contends, defines how these diverse peoples define and experience, or don’t experience freedom. The play is meticulously researched, and the setting by director Keystone provides the spare but important background for Hsuan-Kuang Hsieh’s integral projections. Adam J. Frank’s lighting becomes a character, defining space and difference quickly as one moves from scene to scene. The entire piece is as much choreographed as directed by Keystone, with results as powerful as they may be controversial. “Ameryka” is only at the Douglas for a week or so, so catch it while you can. It is most certainly worth the time, but bring your thinking cap and be willing to ponder all the details for some days to come. One of the delights of living in this particular theatrical epoch comes from the willingness of modern audiences to accept the concept of playing with antiquity. Thanks to everyone from Orson Welles to The Royal Shakespeare Company, resetting and remolding Shakespeare is now more the rule than the exception. Go back even further, and the great Greek tragedies have been played around with just as much, if not more. Indeed, their survival has come from the timelessness of their themes. Twisting these universalities to reflect our own times is not that big a stretch. Which brings one to Nancy Keystone’s “Alcestis,” which uses the Euripides play of the same name as foundation for a remarkable journey. 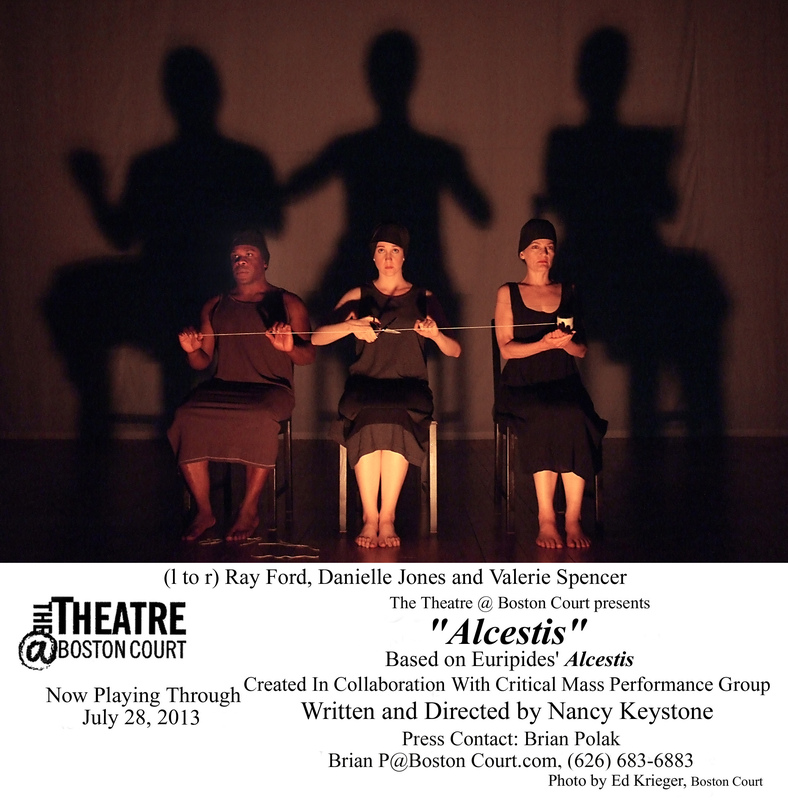 Now receiving its world premiere as a co-production of The Theatre at Boston Court and Critical Mass Performance Group, “Alcestis” takes an ancient and deeply mythical story as a way to examine the nature of sacrifice, of mourning, and of relationship. The result is sometimes very funny, often deeply insightful, and occasionally rippingly visceral. In other words, it is a theatrical delight. In the Alcestis myth, the young king and former Argonaut Admetus, aided by his friend Apollo, wins the hand of Alcestis and takes her home to be his queen. Though many of Greece’s deities are ranged against Admetus and his bride for a myriad of reasons, Apollo continues to come to his aid. This, most especially, when the gods decree that the young king’s life shall end quite prematurely. Apollo gets the fates drunk, and talks them into agreeing to take someone else in Admetus’ place should someone else volunteer. In the end, after everyone else has declined, it is Alcestis who agrees. From there, the plot thickens further, and Keystone’s play really begins. So, what would it be like to volunteer to die for your husband, especially if it doesn’t happen right away? And what must it be like to have someone you love taken in your place? And how would that resonate in a modern marriage? This the core of Keystone’s artful storytelling, which uses dance, music and symbolic gesture, along with considerable humor and occasional side references to the Euripides original to tell a compellingly poetic tale. Jeremy Shranko creates a center for the piece as a likable if not particularly empathetic Admetus. Watching him deal with the often poundingly superficial rituals of modern grieving, or the symbolic weight of guilt and loss, creates fertile foundations for the work of everyone else in the cast. Likewise, Kalean Ung’s practical, loving Alcestis, balancing realities against the romantic ideal, gives a lightness to the play’s beginning which sets the tone for what will follow. Everyone in the small, extremely able ensemble cast adds to the mix in interesting and deeply connected ways. Russell Edge’s Death is intrusive but not really scary. Lorne Green’s statuesque Apollo is as much Admetus’ buddy as some supreme being. Danielle Jones’ nursemaid voices the ache of nurturing, while Valerie Spencer typifies the self-absorption of extreme wealth. Yet, even in such an intensely ensemble production one cannot deny the standout performances of Nick Santoro as the over-obvious, rather dim Herakles (or Hercules), complete with his own outrageious send-up of Metal band music, and Ray Ford, whose sardonic servant and most vocal muse together provide the glue which holds this episodic tale together. Playwright Keystone also directs, which is sometimes a dangerous thing but here provides a single, cohesive vision. Indeed, the sheer simplicity of the setting makes one listen, not only to the words, but to the movements which often speak louder than words – far more able to illustrate, say, the toll of grief than talking ever could. Even when it comes to words, she blends mediums, adding to the mix of five translations of the Greek version with snips from everyone from Plato to Rilke to Woolf on Euripides’ original themes. It makes for a very rich, satisfying stew. 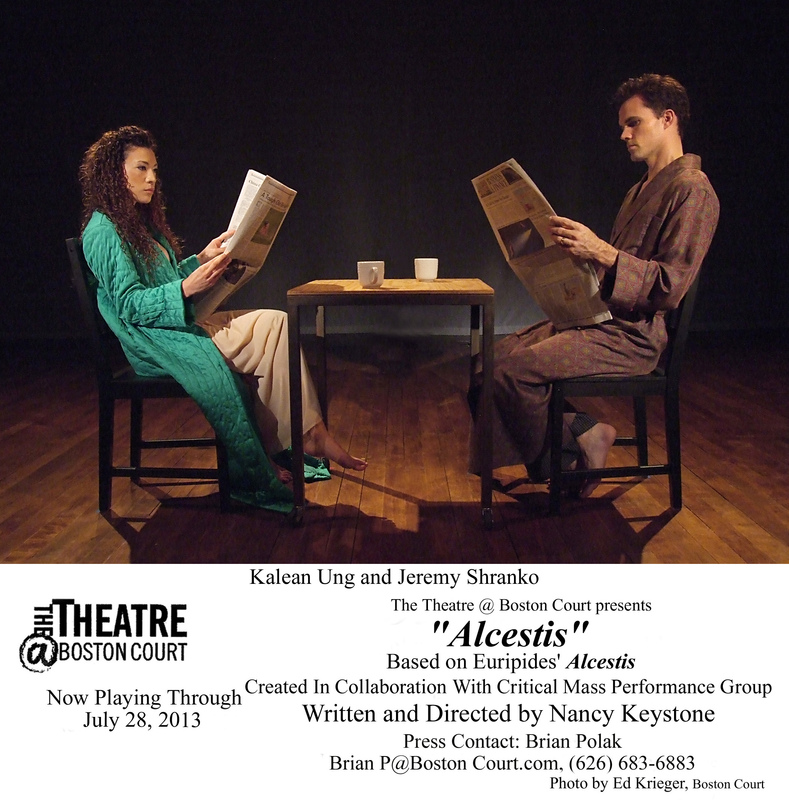 “Alcestis” is funny, wrenching, inventive and deeply felt. It runs for about an hour and a half without an intermission, but leaves you startled at the end by the passage of time. In its juxtaposition of the extraordinary with the mundane, it offers more then just a comment on the struggle between fate and the powerful, but rather a chance to reexamine the intimate relationships of one’s own life. Food for thought, indeed. But then, much fodder for discussion is the natural outcome of a sojourn at Boston Court.